iPad Quasar for iOS 7? Screen split? Discussion in 'Jailbreaks and iOS Hacks' started by bluechipBMW, Apr 10, 2014. Does anyone know if there is an alternative to Quasar for iOS 7? I would love to have a tweak to allow me to split screens. Evan Swick is very close to releasing an alternative to Quasar. Should be out in the next couple of weeks. The tweak is called: OS Experience. Thanks for the heads up! I'll keep my eyes opened for it! I think OS Experience would be better if they had a snap like feature in changing windows. Such as not freely changing the windows, but similar to the Note an app would snap to any open app. I don't mind the price of 9.99. It's an awesome tweak, just the implementation as far as interacting with the apps could be better. I'll still will be purchasing it when it comes out nonetheless. That video is very impressive, and I'll probably buy it to reward the developer's efforts. This would allow one to have two apps nicely side by side in various scenarios, and could be very helpful in some multitasking situations. Especially on full size iPads. I am quite disappointed in that hands on preview tbh, he didn't show fully what the tweak was capable of. The 'arrows' button, as I've been calling it, lets you go into fullscreen mode by pressing it. By dragging it, it resizes the window. By holding it, it rotates the app. Apps that do not support rotation will not rotate. It detects this, though, and apps won't become upside down. Neither would I mind the $10. After all, I paid the same for Quasar. I'm willing to support top JB devs. Quasar was kinda buggy, but I enjoyed the fact of having multiple windows. I remember always having 4 windows open. But this is Quasar 2.0 due to not only having the ability to use multiple windows they can have multiple springboards. Can this tweak do a simple split screen with no text size reduction? 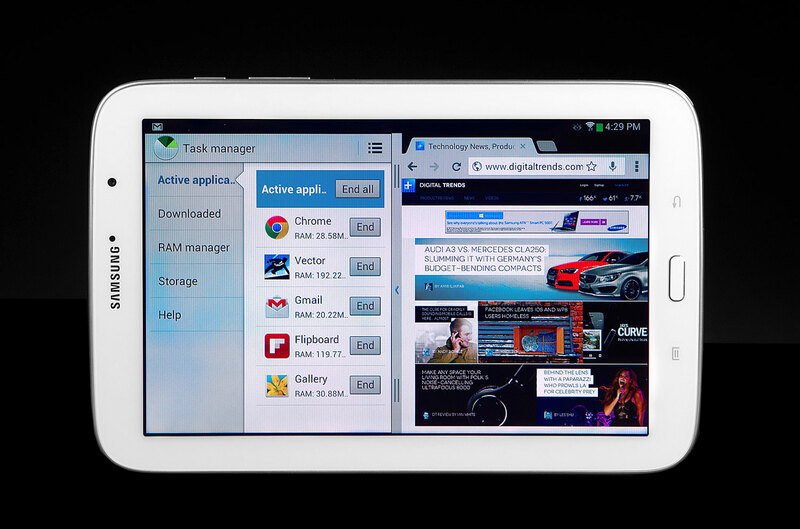 Simply just 2 pane like the Samsung Tablet? You will be able to rotate 2 apps into portrait while the device is landscape, yes. Cool, iOS6 will also be supported (my iPad2's still on iOS6 to support my development). This is great! I'm looking forward to this tweak! Thanks, I asked the same question on his Twitter and posted the same picture. Same here. I always check out the new release section in my Cydia client to see if it's already released - at least twice a day.. Hope he releases it ASAP. He said in the next week or two last week. So realistically I would think it's probably coming sometime next week, guess it will depend on the bugs. I always enjoy reading your reviews, they are very intelligently written and very informative.